BASEL, Switzerland, March 9, 2011 (ENS) – Protests over timber corruption that has made a billionaire of the chief minister of the Malaysian state of Sarawak and enriched his family at the expense of the state’s indigenous and other citizens have spilled over to the streets of San Francisco, Seattle, Ottawa and London. A Swiss nonprofit organization is asking the law enforcement authorities in the United States to investigate what they allege is a murder on U.S. soil and illegally acquired assets stashed in the United States as well as other countries. Sarawak stretches for over 750 kilometers (465 miles) along the northeast coast of the island of Borneo. Once blanketed with highland and lowland tropical rainforests, over the past 30 years the rainforests have disappeared, driven by the demands of the logging industry. Malaysia’s deforestation rate is increasing faster than anywhere else in the world, but until now, facts about the people and companies responsible for deforesting Sarawak have been shrouded in secrecy. A new report released today by the Swiss Bruno Manser Fund exposes the Sarawak timber industry’s complex structure and its links to Abdul Taib Mahmud, who has been Sarawak’s Chief Minister since March 26, 1981. Elections will soon be held in Sarawak, likely within the next six weeks. In February, the nonprofit Bruno Manser Fund launched an international campaign against what the group calls “the blatant corruption and abuse of public funds” by Taib and his family and political associates. The organization, based in Basel, is named in honor of Swiss citizen Bruno Manser who disappeared in Sarawak while defending the rights of the indigenous nomadic Penan people. Manser was last seen in May 2000 in the isolated village of Bario, Sarawak; he was declared legally dead in 2005. The new report, “Development of global timber tycoons in Sarawak, East Malaysia – History and company profiles,” is authored by Daniel Faeh of the University of Bern’s Economic Geography Group. For 30 years, indigenous people across Sarawak have been beaten, arrested, jailed and killed defending their traditional forest lands against forced development. Today in San Francisco, anti-Taib demonstrators went to the Citibank branch at 260 California Street in the city center. The building is the seat of Taib’s Sakti International Corporation, which used to be headed by the late Ross Boyert. After having been dismissed by the Taibs, Boyert filed legal action against Sakti in a San Francisco court in early 2007. Boyert, who administered the Taib family’s U.S. properties for 12 years, was found dead last September in a Los Angeles hotel room with a plastic bag tied around his head. In an interview with the London-based Sarawak Report given weeks before his death, Boyert said he and his family had been harassed and terrorized by Taib agents ever since he had filed the case. 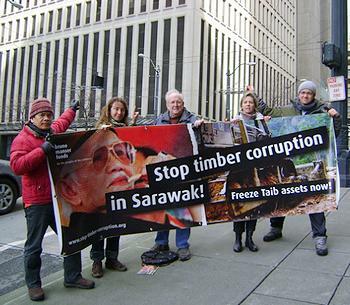 The Bruno Manser Fund, together with an international NGO coalition against Taib timber corruption, is asking the U.S. authorities to freeze all Taib assets in the United States and to investigate Boyert’s allegations against the Taibs and the circumstances of his death. The Bruno Manser Fund says the Taib family “has profited immensely from the destructive logging of Sarawak’s tropical rainforests and today has a stranglehold over the state’s economy.” Among the companies controlled by the Taibs are Achi Jaya, which has a monopoly on log exports. The Swiss NGO and its supporters have published a list of Taib’s “secret” foreign assets and are urging the governments of Australia, the British Virgin Islands, Canada, Hong Kong, Jersey, and the United Kingdom as well as Malaysia, to investigate the financial transactions of these 49 companies under their respective anti-corruption and anti-money-laundering legislations and to freeze all Taib family assets for later restitution to the people of Sarawak. On March 3, anti-Taib protesters appeared in front of the Taib-owned Abraham Lincoln building in downtown Seattle, where the Northwestern Regional Headquarters of the Federal Bureau of Investigation, FBI, are located. The Seattle property is held through Wallysons Inc. The Bruno Manser Fund says Wallysons’ chairman is Taib’s son, Sulaiman (Rahman) Taib, while Taib’s Canadian son-in-law, Sean Murray, is its president. 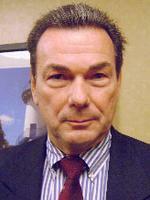 The Bruno Manser Fund and its allies are asking the FBI to investigate the financial transactions of Wallysons and other Taib-controlled properties in the United States. When demonstrators attempted to enter the building to speak with FBI investigators, they were denied entry. 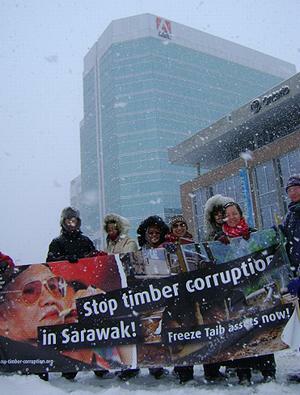 On February 28, anti-Taib demonstrators appeared on the streets of Ottawa and London in an attempt to publicize what they called timber corruption and victimization of indigenous people in Sarawak. The Bruno Manser Fund lodged a detailed complaint in June 2010 with Jeanne Flemming, director of Canada’s Financial Transactions and Reports Analysis Centre, FINTRAC, over the Canadian government’s business ties with Taib family companies. The complaint centers on the fact that 11 Ontario Government ministries are occupying offices at Sakto’s Preston Square Tower III in Ottawa. 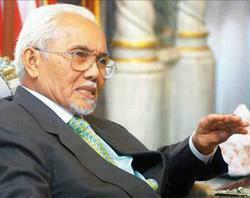 The Sakto Corporation, an Ottawa property developer, was founded in 1983 by Onn Mahmud, Taib’s brother. The Bruno Manser Fund alleges that the company’s rapid development has been funded with illegal timber trade kickbacks channelled through two Hong Kong businesses. FINTRAC has left the complaint unanswered. In the report published Tuesday, Faeh writes that Sarawak’s timber industry is more than a Malaysian issue – it is a cause for global concern. 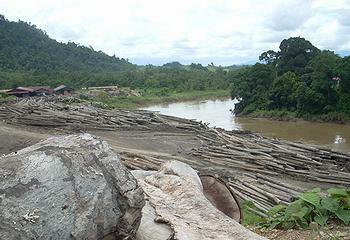 In the late 1980s, Sarawak experienced one of the most rapid log clearances in Southeast Asia. With these profits, timber groups from Sarawak such as Samling, Rimbunan Hijau, WTK, KTS, Shin Yang and Ta Ann accumulated capital which allowed them to expand their business operations all over the globe. They are now operating not only in Southeast Asia but also in Australia, Africa, Central and South America, Russia and the Pacific, the report states.